Pinchos de Pollo | This post was sponsored by Pompeian. All opinions expressed on my site are my own. As I write this I am sitting on a plane on my way home to Puerto Rico. I am so excited to visit my beautiful little island, spend time with family, and eat all the food. And if there is one thing Puerto Rico does well it’s food, especially street food. Growing up my family and I would spend Sunday afternoons driving around the island. Sometimes we would drive along the coast and other times we would venture into the mountains. We rarely had a set plan except to see the sights and eat at any roadside kiosk we stumbled upon. One of my personal favorite street foods is pinchos de pollo. 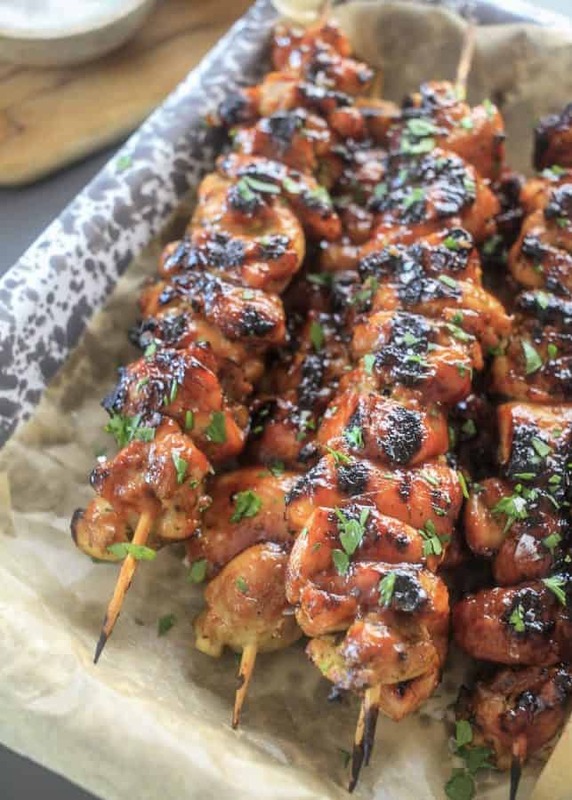 If I am really hungry there is nothing more satisfying then a stick of marinated chicken with a barbecue glaze. They are typically served with a slice of white bread making them a complete meal. 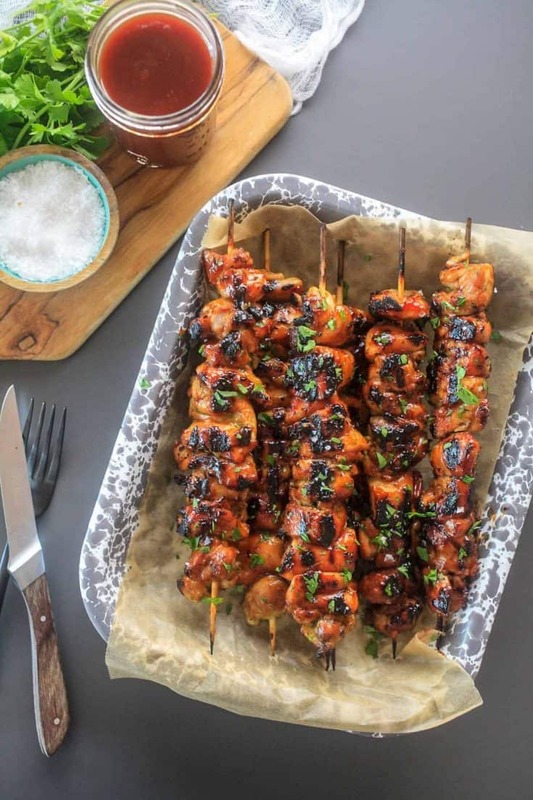 Looking at these chicken skewers they look like your typical barbecue skewers but, what makes them really special is the marinade. The chicken marinades in a mixture of olive oil, vinegar, adobo, sazón, garlic, oregano, and bay leaf. It’s basically a flavor party. I then lightly brush them with a barbecue sauce to give them a little sweetness. 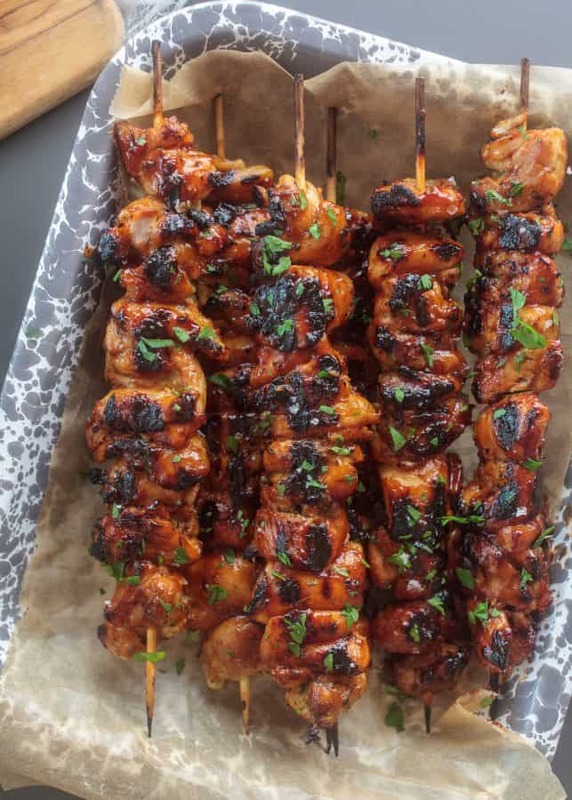 If you really want to take it up a notch you can use my guava barbecue sauce. 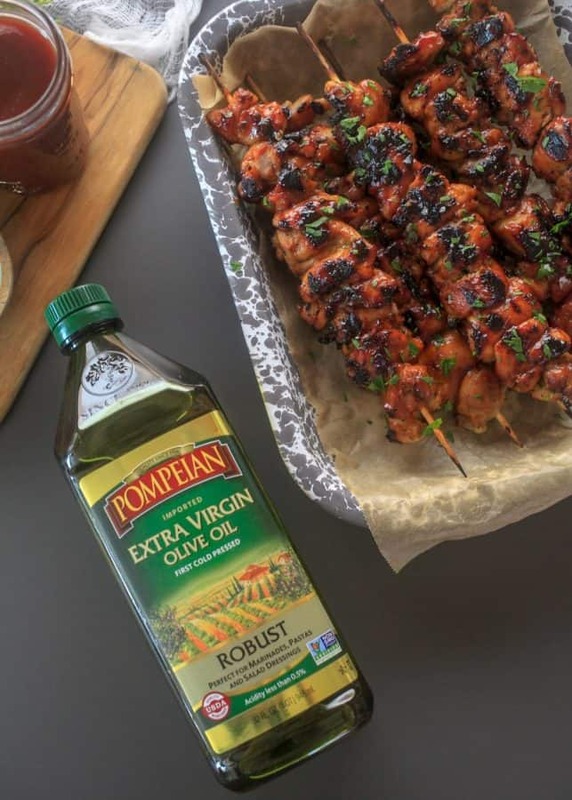 Pompeian Robust Extra Virgin Olive Oil has a full-bodied flavor with fruity notes making it ideal for marinades. This extra virgin olive oil is extremely low in acidity, yet has a spicy and bitter character. It’s also great for pasta salads and salad dressing. It a perfect base for marinated your favorite proteins. Are you looking for more Puerto Rican dishes or street foods? 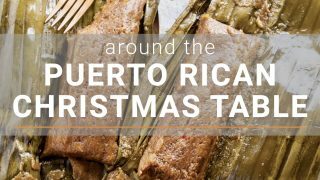 Try my pastelillos de carne, arepas de coco, or explore my entire Puerto Rican recipe collection. What are some of your street food-inspired dishes? But don’t just tell me about them. Show me and Pompeian how you are experimenting with the latest food trends on Instagram. To share your latest on-trend creations using Pompeian, tag your photos with #TrendingintheKitchen. If you looking for inspiration or for tips on how to trend in the kitchen, visit Instagram.com/Pompeian. 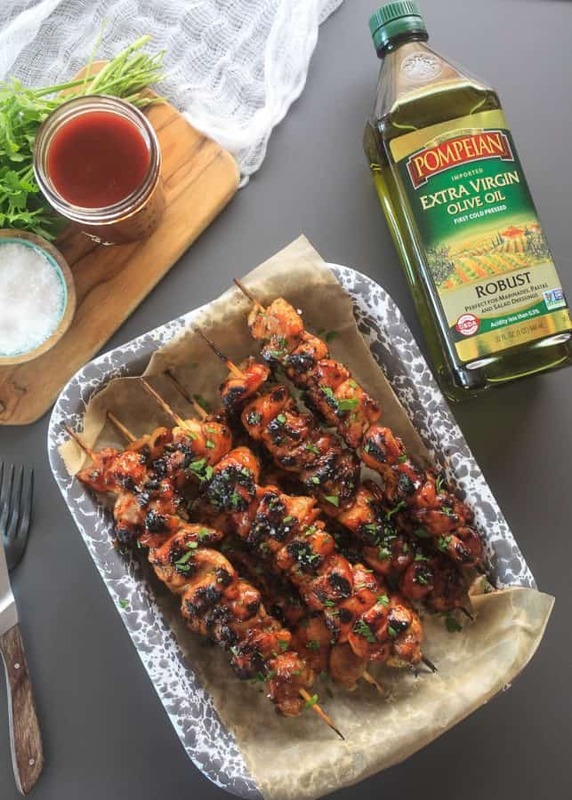 Thanks to Pompeian’s ongoing commitment to quality and innovation, home cooks can depend on Pompeian’s olive oils and vinegars as a great tasting base while exploring new flavors and ingredients. Pinchos de Pollo (Puerto Rican Chicken Skewers) | These are one of my favorite street foods from home. The chicken marinades in a mixture of adobo, sazón, garlic, vinegar, & olive oil. It’s then lightly brushed with a sweet bbq sauce and grilled to perfection. Cut chicken thighs into 1-inch dice. Combine chicken, olive oil, adobo, salt, sazón, oregano, white vinegar, and crumbled bay leaves in a large resealable bag. Seal the bag and mix the chicken until well combined. Refrigerate for 1 hour or overnight. Soak bamboo skewers in water for 30 minutes. Thread chicken on to skewers making sure not to pack the chicken too tightly. Brush the skewers lightly with barbecue sauce. Heat grill to on high to 500 degrees. Lightly oil the grill grate to help the skewers from sticking. Place the skewers on the grill and sear on each side for 3 minutes. 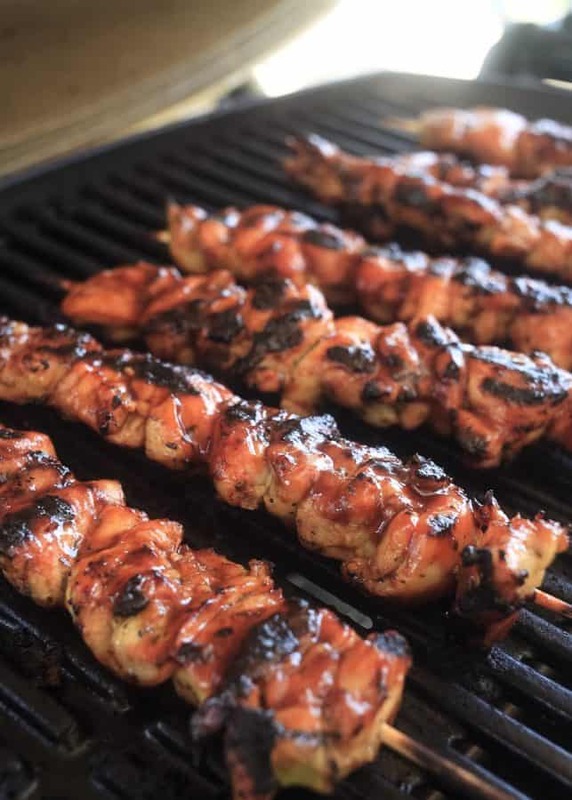 Brush the chicken skewers again with barbecue on both sides. Lower the heat to medium, about 400 degrees, and grill for 4 minutes. Serve. Hi Meseidy, I’m wondering which brand of BBQ sauce you use for these? I used Sweet Baby Ray’s but any bbq sauce will work. DELICIOUS!! Thank you so much for this recipe. Reminded me of when I was younger and spent summers on the island. The BBQ sauce was delish too. I made these for a BBQ and everyone loved them.